One of my fellow Little Trekkers Ambassadors posted a drool-worthy photo of ripe blaeberries (bilberries) yesterday, and noted that they were particularly abundant this year. So although the forecast was for murky drizzle and rain, we decided to brave the mental driving* over the Cairn o’ Mount road and go back to an old haunt at the foot of Clachnaben, in Glen Dye, to go foraging. *’Mental driving’: expect to encounter slow-moving cyclists round every corner, and oncoming speeding 4×4’s overtaking them on blind bends. I’ve yet to drive this road without swearing loudly at oncoming traffic. I think the whole of Aberdeenshire had the same idea: the wee car park was full, the overspill layby was full, cars were parked along the side of the narrow road and in the slowly-dripping-downhill bog opposite. One white car blocking a forestry path nearby had already been written on with blue marker pen. So we kept driving on to try out Scolty Hill near Banchory. Well, we quickly abandoned that, too, because we were 5p short of the £1 minimum parking charge. The Boss agreed to see whether he could ask another motorist at the ticket machine for the missing 5p, but came back muttering darkly that we were to give up and go home. Ever the optimist, and determined not to have a long drive in vain (it was now 1pm), I stopped again at the Glen Dye car park. And found a space! Within a minute, we were out, covered in waterproofs and off down that forest path. The best blaeberries are only about 100 – 200 yards from the car park, so we didn’t have far to go at all. As usual, we reminded the kids not to strip a bush bare, not to be too greedy (one Treasure Jar = 500g of fruit (ish) = plenty), and not to trample the ground. And oh my stars, they certainly are / were abundant! There were very, very few under-ripe ones, so I should think they’ll be gone by the end of the week. After about 3 minutes of picking, the midges found us. I giggled through a long-winded explanation of what ‘Character Building’ meant to the minxes and how midges crawling over them would do just that. They didn’t appreciate it, and went from being irritated to angry to howling with rage within another 5 minutes. Midi started to get a bit distressed at the midges, so I looked up. It was quite a swarm around us! So we split up and headed in 5 different directions to try to lessen the swarm. Nah – they just called all their friends to come feast on the foragers. Another 5 minutes later and The Boss called a halt to the foraging – his sensitive skin comes up in big weals with midge-bites and the poor man was beginning to look like Lizard. 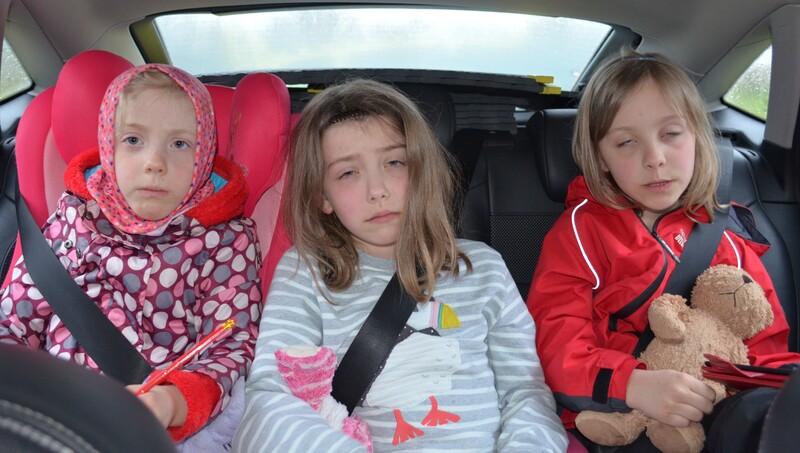 We ran away bravely to the car, where I keep a first aid kit containing a packet of loratadine antihistamine tablets. Luckily I’d got the one you can give to children over 30kg – poor Midi Minx obviously inherited her Daddy’s skin, whilst the other pair are a bit more midge-resistant like me. When we got home, we immediately displayed our fundamental priorities: I started weighing and washing the blaeberries to make jelly, Maxi turned on the Tour de France on the TV, her sisters got out their My Little Ponies, and The Boss checked his bare legs for ticks. He found 3 immediately. Screeeeeeech to a halt! The minxes were told to drop everything, strip off their lower clothing and line up on the white bedspread for a tick check. Midi found 2 crawling on the sheet, Mini had been bitten by 2 and had another on her. Bleurgh! I’m not overly concerned about the risks of Lyme disease (I caught it myself in 2005) because they were off so quickly, but I’ll obviously keep a wee eye out for bulls-eye rashes on her or flu-like symptoms over the next 3 weeks. I think you can see by the photo of Mini way up there ^^ that those bare ankles were enough to attract them. Even though we weren’t near bracken, it’s obviously tick-heaven in Glen Dye right now. We’ll go back in a day or 2 for more berries, but next time will remember to tuck long trousers/leggings INTO socks, do buddy-buddy tick checks after being out, and I’ll buy another of my favourite tick hooks at the vet’s – I gave the one I keep in my purse to my mother-in-law and forgot to replace it because The Boss has one too. You can’t have too many O Tom tick twister hooks, in my view! I’ll let you know how the jelly turns out. How would you use a glut of blaeberries yourself? Have Historic Scotland membership; will use it! The Boss and I compared the properties on the Historic Scotland website that we could drive to, alongside their forecast weather, in a demented game of Top Trumps. We settled on Arbroath Abbey. I vaguely remembered visiting it when I was around Maxi’s age and thought it might be quite interesting, so off we drove. It was empty bar 3 or 4 other people. Maybe they’d heard we were visiting..? 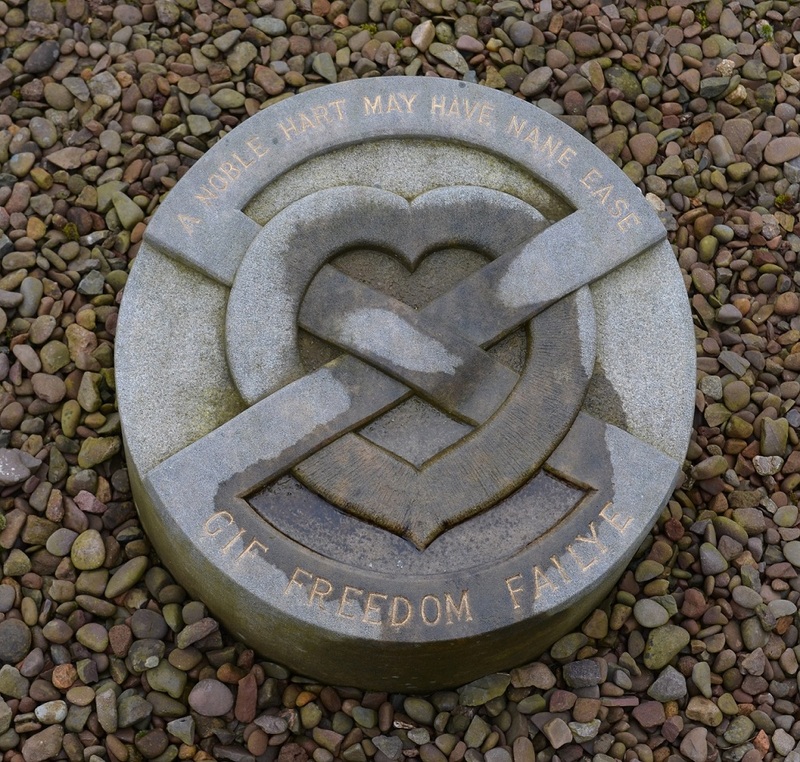 We started by touring the indoor visitor centre, whose displays and panels listed the Abbey’s historical timeline, described its links in the 1950s with the Stone of Destiny, and explained why the Declaration of Arbroath in 1320 – signed at the Abbey – was so significant in Scottish history. Upstairs in the visitor centre is a model of the finished abbey and a wall of glass through which you can see the Abbey, presumably for when it’s too wet to go out and explore yourself. Minxes being minxes, they needed to get outside and explore and touch and see and compare. So they did. With much glee. I’m still surprised when they enjoy visiting old crumbly ruins, but I think they each get something out of it: 6 year old Mini likes the freedom of being able to run around; Midi is fascinated by sculpture and carving; at nearly 10, Maxi’s imagination lets her picture what life was like hundreds of years ago, and she’s curious about the differences. 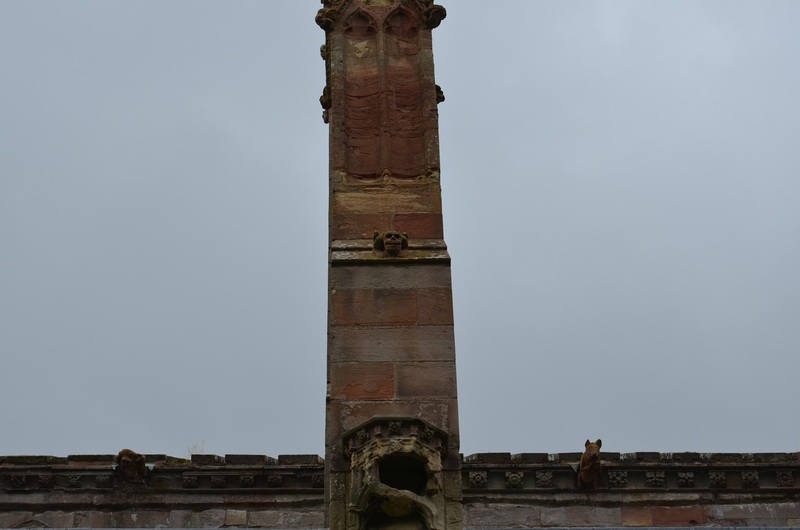 The red sandstone of Arbroath Abbey hasn’t stood up to the elements as well as that at Melrose Abbey, so there wasn’t so much stonework for Midi to study. However, the intact Abbot’s House had some exhibits and replicas inside that took all the hard work out of Maxi’s imaginings and brought the building to life. We paused for quite a while trying out the very long echo of the sacristy. Even still, it didn’t take too long to explore every opening door and climb every accessible staircase, so decided to have a look further afield. We’ve been to the town centre of Arbroath a few times, so decided to explore the walk along Seaton cliffs at the very end of the seafront esplanade before going home. It starts beside the public toilets and follows a tarmac path along the edge of the cliffs. 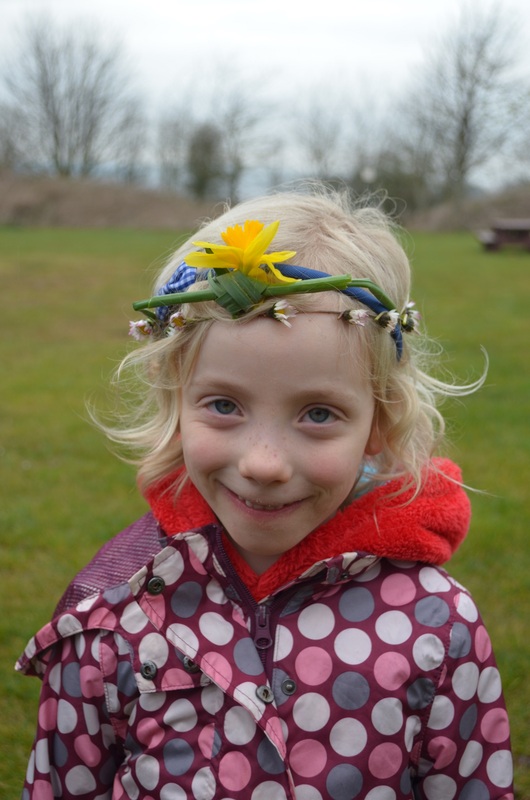 It felt safe enough, but we didn’t venture too far – just as we started spotting the sand martins and were looking out for arches and stacks, Mini suddenly was very glad that the public toilets were so close. By the time we’d walked back, it really was time to go home. Perhaps we’ll finish the walk in the summer. This may be perilous – excellent! Monday Morning Holiday Blues – Not! After a very eventful weekend abandoning the tent and then making the most of it, you’d think we’d sleep in on Monday morning back at home, still on holiday. Well, we probably WOULD have done, had The Boss not set his alarm clock to his normal 0645hrs. Meh! We didn’t unpack because we still harboured hopes of grabbing the little 3-man tent and heading off for a night or 2 camping locally. In the meantime, we spoke again to Kim at Waren Mills campsite, scene of our tent catastrophe, and the lady who tried so hard to help us out at the time. She did an awful lot of to-ing and fro-ing and talking to other people on our behalf, out of the goodness of her heart. The end result is that our booking has been transferred entirely to another date. As we won’t be able to afford a replacement family tent anytime soon, she suggested we stay in one of their wigwams instead. Wow! I’ve never seriously considered glamping, but the prospect of being able to drive down to Northumberland after work on a Friday night, drop the sleeping bags in and get our heads down, and even have a kettle and fridge there, is just amazingly luxurious! 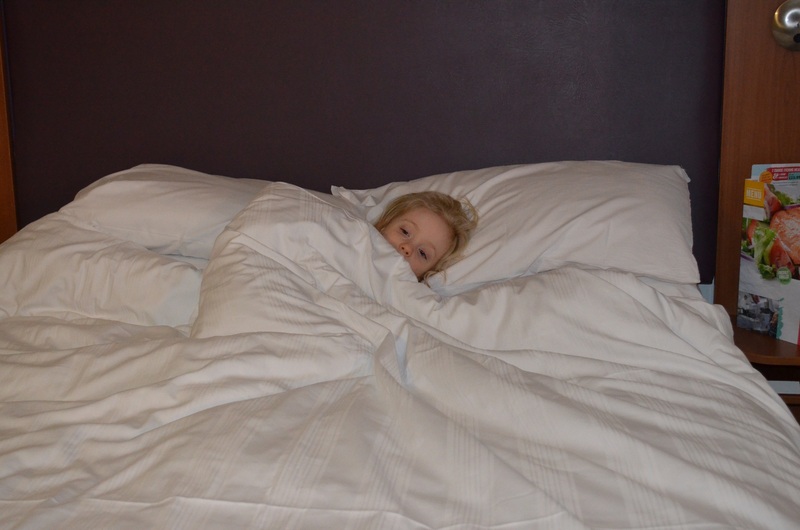 We prefer to sleep in one big huddle anyway, so the one-big-bed approach is just perfect. Even better, we *will* get to explore that beautiful campsite and heavenly location after all – driving away on Saturday with the site and beach unexplored hurt so much. So, I’ve gone from being distraught at losing lots of money with no holiday week to show for it, to now having a weekend in August to seriously look forward to. I absolutely cannot wait and The Boss and the minxes are very excited too. And all because someone at the campsite cares very much about how their customers feel. I’m looking forward to meeting her and saying thank you again in person. On a high, then, we were inspired by the freezing cold rain and sleet outside to go swimming in our local pool. The minxes have swimming lessons there every week, and I’ve noticed finally (finally!) how independent they’ve become. Gone are my days of having to do absolutely everything for all 3 of them, and usually all at the same time. At worst, now, I just need to be on-hand to be an extra pair of hands juggling towels, wash-kit and clothes. I’ve not been swimming in over a year, so one 4-bladed razor head, a clogged drain and half a pound in hair later, and I was ready! 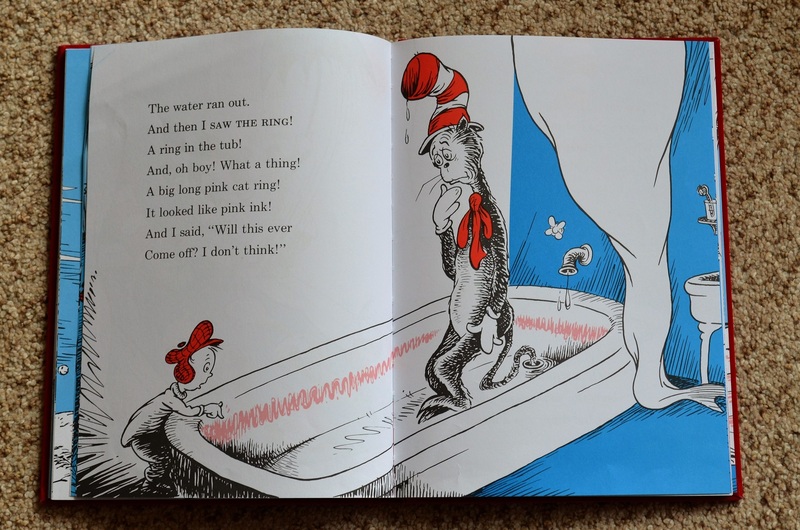 My hair is currently bright red so I brought Midi’s fetching blue swim cap to avoid a Cat in the Hat pink bath ring around the pool. I looked like a blue baked bean. Still, I’m glad I wore it – after 15 minutes of fun, we were all ordered out of the little pool and told to shower with soap before going into the big pool. Someone had blown chunks and the vomit needed to be cleaned up. Poor soul and ewwww in equal measures! Mini seriously impressed me. For the past 6 months I’ve not watched any of the girls swimming because of the timings of their lessons – I spend the entire time moving bags and kit from locker to locker and to and from each girl, and feeding them. Maxi goes straight to Cubs afterwards, too, so that’s a LOT of kit to juggle. Last time I saw Mini swim, she’d been moved back down from Level 3 swim lessons to Level 2 because she refused to get her face wet, even in the shower. So you can imagine my expression when I watched my baby girl happily doggy paddle on a swim-noodle by herself, happily chatting away to me through constant splashes and mouthfuls of water. What a girl! She even asked for help with her current terror: jumping into the pool herself. Channelling her tenacity for good – fantastic! Midi has just moved from Level 4 to Level 5 (after around 2 years of trying hard); Maxi is still in Level 7. They happily rolled in the water, did handstands, showed their proud Daddy how many lengths they could swim, and generally had a brilliant time. Me and The Boss? We got to bob around in the cool water, watching our offspring with pride. But the best bit? Getting out was an absolute breeze. Six solid years of weekly trauma shepherd’s crooking kids out of showers and ushering damp minxes around finally paid off. Have I got across to you yet how smug and satisfied that made me feel?! Crikey, we might even go swimming as a family again soon! After swimming we did a quick and cheeky Lidl run for some savoury pastries from the in-store bakery, then a seriously big shop. The Boss and I finally accepted that the weather within a 4 hour drive of home was just not good enough for us to take little kids camping, so we had a home DVD evening, with homemade popcorn and Daddy’s super hotdogs (they’re super because they include a free onion-chopping and cooking lesson for the kids). Fun and free. 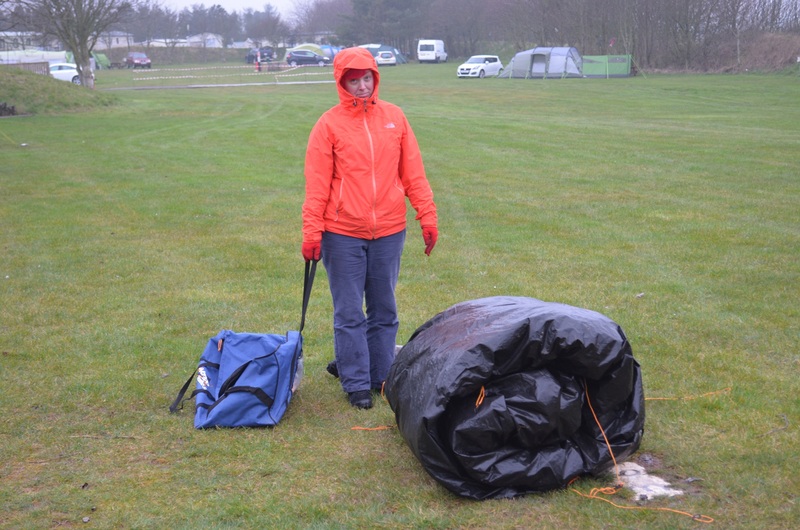 Well, we’ve got to start saving those pennies for a replacement Vango next year. 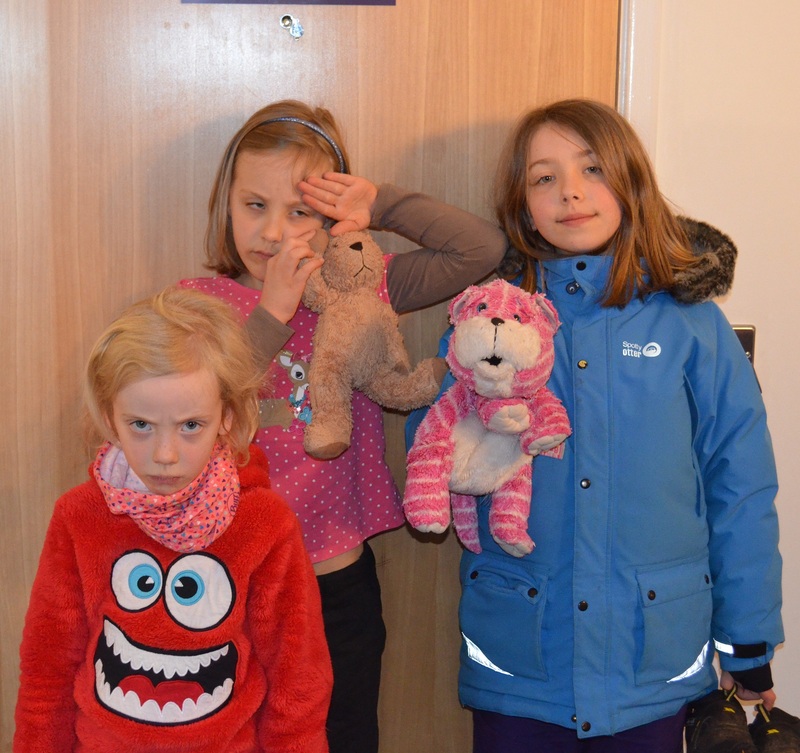 We woke early on Sunday in the Musselburgh Premier Inn after a disastrous start to the Easter Holidays. I’m not sure whether The Boss or I actually slept much, with Mini punching and kicking and karate chopping through the night. The very first thing we did was check the weather forecast. Rain. With extra rain on top. So we changed our plans yet again and hit the all-you-can-eat buffet breakfast instead of heading straight out to explore locally. The service was cheerful and friendly, and the food was fine (apart from the sausages that were hot on the outside, stone cold and pink on the inside, and allegedly not under-cooked, but rather ‘it’s the food colouring’). The girls ate prodigious amounts of everything and we all waddled out to the car to explore the Scottish Borders a little bit before doing the Drive of Shame back home. I’d have liked to have explored Musselburgh and Portobello at least a bit, but the forecast was for the fog and rain to hang around all day. It looked driest south-west of there, so we drove to Melrose. “What’s in Melrose?” asked The Boss. “Dunno. An abbey? Maybe?”, I replied, fountain of all knowledge as usual. A 40 minute tootle through rolling countryside later and we got out into more drizzle. We broke out the waterproofs so we could properly stretch our legs without worrying about the rain getting heavier. Mini was delighted at spotting a shop called Butterfly. It was shut, like everything else in Melrose. I thought that the north of Scotland would observe Sunday closing and that the south would have more of an English attitude, but my experiences have definitely been the reverse! Never mind, Melrose’s main attraction was certainly open: its beautiful Abbey. 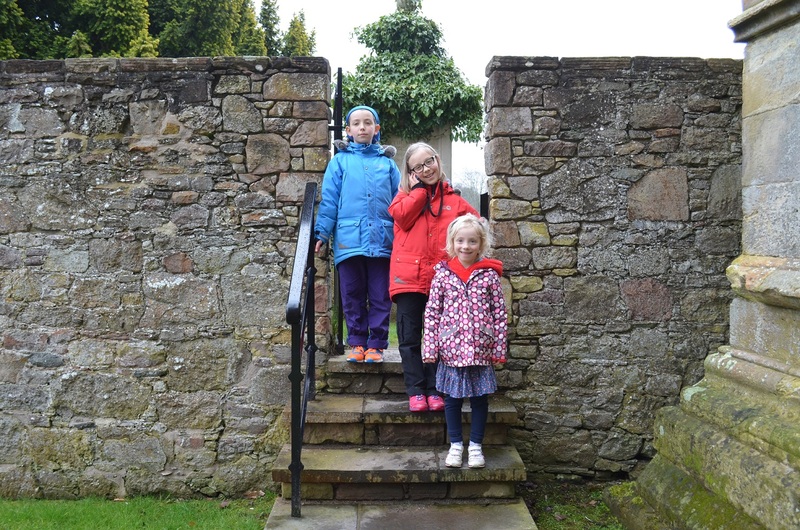 And we had such a brilliant time at Melrose Abbey that I’ve written it a post all of its own. Emerging into the sudden sunshine a few hours later, we decided to push the kids’ hunger levels a little more with a quick run through the small but beautiful Harmony Garden. 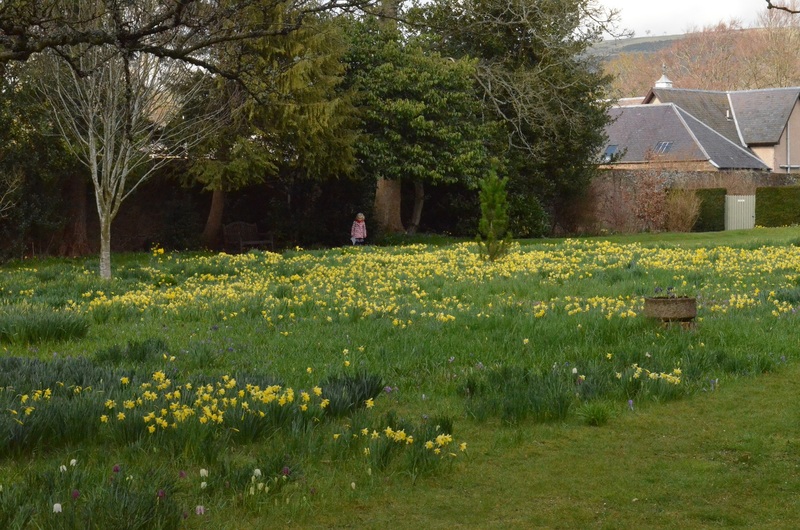 The beds and walled gardens look like they’ll be incredible in the summer; the bulb lawn, crocuses and fritillaries made me feel very Spring-like. Lunch! Get me to some lunch! Tired and hungry, we finally agreed to go seek some food. That was going to be interesting on a Sunday with everything shut! Luckily, I spotted a line of people coming from near a banner advertising The Abbey Mill, proclaiming that it sold woollen goods and had a coffee shop. Going to be the last taste of tea, I think! Within 20 minutes, all that was left was a small half-ring of onion, a single egg mayo sarnie and half a cupcake. It was absolutely delicious, completely filled us up, and at £6 a head was brilliant value for such high quality food. Midi laughed when I blushed at the praise meted out to the minxes for their good behaviour and pleasant table manners. I tell you, I basked in it, savouring every word. It might tide me over next time we’re slinking out on the Walk of Shame from another cafe on a different day. We ambled over towards the River Tweed to the chain bridge. We walked over it just for the sheer hell of it, though poor rule-abiding Maxi got herself in a right state waiting for there to be less than 8 people on the bridge at any one time so she could walk over. We didn’t tarry too long on the other side – the path was one long dog poo obstacle course. So we walked back again in the direction of the town centre, via a bit of parachuting off a fallen tree, in search of a play park. We found a fantastic and very busy playground past the rugby ground and over beside a busy caravan park. The minxes wore themselves out over a one hour thrash around. The bark chippings underfoot were very thick, the play equipment wonderfully varied, Midi made a new friend, and all 3 tried hard to wrench their arms out their sockets on the monkey bars especially. Around 5pm it was time to call it quits and finally head for home. We paused at Leaderfoot Viaduct to have a good look around and for The Boss to boil a kettle for hot chocolate and coffee. We saw plenty of cyclists zoom down the cycle path from the viaduct and onto Drygrange bridge – maybe that’ll be us in a few years? – but the sheer number of dog poo deposits left on the grass verges, cobbles and paths around that area mean that I honestly can’t recommend it as a stop-off. Unless you’re wearing footwear that can be easily hosed down. It’s pretty disgusting. We’re talking 2 dog poos per A4 paper-sized area of grass. Bleurgh! So a quick coffee and back on the road. a very, very welcome sight – The Boss bearing goodies! I wonder whether the cables will stay, like the Milieu Bridge, or if they are temporary? So, we unexpectedly arrived at 900 year old Melrose Abbey, all ready to spend an hour or so running around the grounds in the drizzle. There was an entrance fee. Of course there was. But the friendly and knowledgeable David explained that if we were likely to visit 3 or 4 Historic Scotland sites in a year, then we’d be better off with an annual ticket. And best of all, paying by monthly direct debit would cost the same overall as paying in one installment, and would mean paying less today than a one-off ticket. 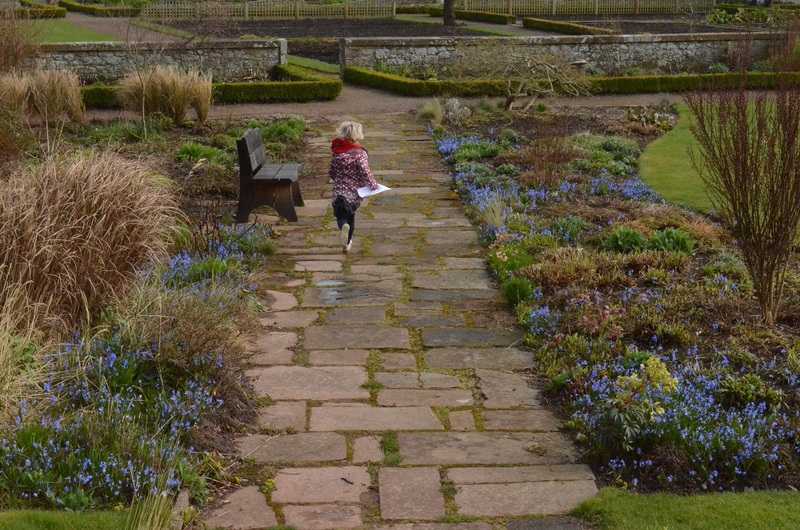 A quick look at the list of Historic Scotland sites convinced us both that we’d be visiting an awful lot more than 3 or 4 sites this year – perfect! Tooled up with a free audio guide for Midi, a quiz-sheet for Maxi, and undivided parental attention for Mini, off we set to learn more about the monks who’d set up and lived in the abbey. 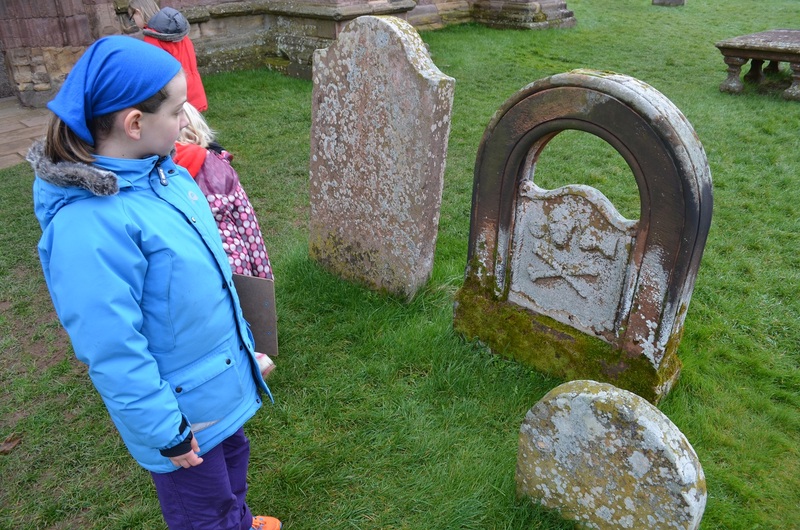 Mini was obviously listening to me explain who Robert The Bruce was and why his heart was allegedly interred here – she merrily explained who King Robert was later when we visited Arbroath Abbey and talked about how he’d organised the writing of the Declaration of Arbroath. I got distracted by the beautiful and still-intricate stonework. I liked the crouching demon and bagpipe-playing pig gargoyles best, and helped Mini spot the telltale zigzags on walls where old staircases used to be. We 4 eldest all trekked to the top of a spiral stairwell to the very top of the abbey. Such a beautiful view! But I made the mistake of looking over the barrier, down a 25m sheer drop to the ground. I instantly lost my ability to focus, so trotted down the stairs to rescue a scared Mini and take her to ground level. Meanwhile Maxi and Midi impersonated another gargoyle very well. I’m glad that The Boss’s (far fitter) thighs burned as much as mine on the return to ground level. Made me feel like less of a loser. After answering all the questions on Maxi’s sheet, reading all the excellent information boards and counting stone-mason marks, we walked over the medieval drains to the 16th century Commendator’s house, which is now a museum. Midi tried on one of the monk habits and looked for all the world like a cream-coloured ghost. The girls spent some time colouring-in and having their imaginations fired by the little dolls while The Boss and I looked at the stones and exhibits and sniggered like teenagers at the unearthed piss pots. I didn’t expect to enjoy the visit as thoroughly as I did; it was worth making the journey (had we not found ourselves there by accident). The rest of our day in Melrose was just as fabulous. Today I sweetened the hellish ordeal that is school shoe shopping for 3 girls by taking them all the way to Arbroath and going to Wetherspoons for lunch. It wasn’t just for the treat – I may have looked like a harassed, dumpy, middle aged mum to casual eyes, but underneath I was an eagle-eyed, inquisitive, secret reviewer of The Corn Exchange‘s child-friendliness for the Soil Association. As I explained when I reviewed our lunch out at McDonalds last week, the Soil Association are using an army of parent volunteers to help them in their Out To Lunch mission to assess and improve big food chains’ approach to feeding and serving children. So how did our visit go? Well, we loitered outside in the sunshine for a while, reading the displayed menu in detail and bickering over whether it was ok for one girl to have a lemon San Pellegrino if the others were having orange… Give me strength! I must have banged my head letting them drink fizzy pop at all. But better to get the squabbles over and done with in private before walking past the big “Families Welcome” sign. I settled the minxes at a big empty table before ordering immediately. Children weren’t welcome at the bar itself, so I had to leave them at the table and hope for good behaviour (“You’re in charge of her; you’re in charge of her; you’re in charge of the table; you’re in overall charge; I’m right over there at the bar and I can see and hear everything!“). There was no children’s menu, so I had a lot of questions about which meals might be appropriate for the younger girls and whether the adult food portion sizes could be varied. The staff member taking my order (the Duty Manager) apologised for there being no children’s menus out and said that the portion sizes couldn’t be varied. Oh. However, she made some appropriate alternative suggestions for Midi and Mini’s orders. The high-chairs are the brilliant sit-beside-the-table ones, so the baby is sitting with the whole family rather than being a little outcast satellite self-contained table. Lots of the restaurant’s tables are in booths or in cosy nooks, giving good privacy for breastfeeding. Maxi: “She didn’t seem like she was rushing away. When she asked us a question, she actually waited until we’d replied and really listened. Not like you, Mum”. Maxi and I had lasagne; Midi and Mini had the children’s cheesy pasta (macaroni and cheese with some broccoli stalks and peas stirred through); we had a couple of additional sides because we’re all garlic freaks and are greedy. Mini: “It’s so yummy! Much nicer than your macaroni” (No. No praise for my cooking at all, there). Talking of the broccoli and peas, I loved that the children’s food came with 2 green veg and a fruit bag as standard; chips, garlic bread and fizzy drinks* were extras. Normally it’s the other way round – I usually have to ask for extra / any vegetables – so that makes me feel that someone’s thinking about the nutritional content of the food served. It would have been even better if the fruit had been a wee bowl of fresh fruit instead of processed, bagged Del Monte apple slices and grapes, but that’s just me nit-picking. Would the person preparing the (good) adult side salads have the capacity to chop extra fruit, too? *Well, I say that fizzy drinks are extras. But now that I’m home and can actually look at the children’s menu, I can see that I could have had fizzy pop or a healthy drink included as part of the meal. What a shame – if I’d known, I’d have asked for the free bottle of water as well as ordering the Evil Fizzy Pop for the kids anyway. So would I eat there again? Yes. Yes, I would. It cost twice as much as the McDonalds lunch but the improvement in comparable food quality meant it was better value for money. And it filled us up for longer. 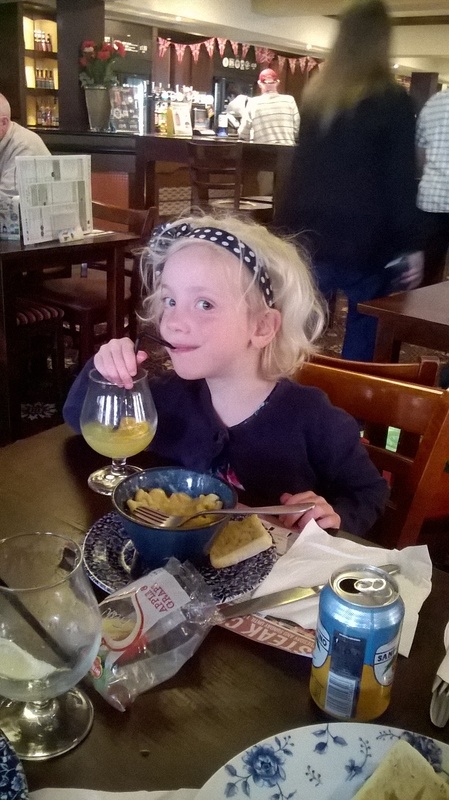 I think Wetherspoons have tasty, decent fast-food for kids at a reasonable price nailed. They just need to make more child-friendly amenities available to move them from good to great.